I am going to add a joystick to the back of my 9x to control a 3 axis gimbal hung below my multirotor. I will use the feeds from two pots for this. Anyone else done this and have any advice? I have seen it done with a PS2 joystick but it looked a bit complicated! I think if you google "joystick mod 9x" that you will find some videos of how to accomplish your goal. It not too hard to do. Its very simple actually, all you have to do is wire up a 2way switch separately from the 2 pots to a joystick (Like an xbox controller joystick) and then switch between them when needed. If I get a chance, I will take apart the radio and take some pictures for you. Last edited by LTMNO on Wed Oct 02, 2013 1:56 am, edited 1 time in total. You can use the very flat PSP 1000 type joystick. I use the psp joystick, it works very well. very precise control with the Tarot brushless gimbal. cre8tiveleo wrote: I use the psp joystick, it works very well. very precise control with the Tarot brushless gimbal. Thanks for the help. Just trying to get my head around the wiring now. If I use a DPST switch I can leave the pots in place and switch between them and the joystick? 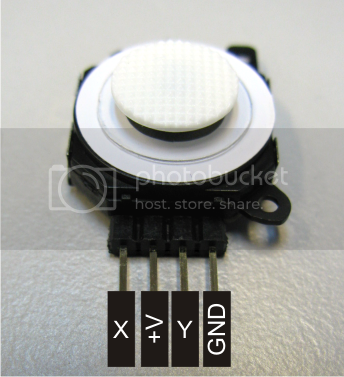 You have four wires to your PSP 1000 joystick, is that 5v, ground and then which two from the pots? Black is gnd, Red is Vcc, Yellow and blue are your two pot connections. when using p1-3 initially, we should calibrate P1-3. now with this pot in, you basically disabled the P1-3 (whichever two you use) and recalibrate the two pots you use? or can you keep the original two pots useable at the same time? if so, how to deal with the calibration for both pots and the button? I just calibrate the joystick. The two pots still work, and you can use as trim for the joystick (It centres well on it's own though) You can also just use two psp sticks one for each axis. I see. If the joystick centers well on its own. May be I should claibrate the Pots instead of sticks, then for application that does not use the stick I still can use the pots as they are calibrated. correct? The pots always go from 0 to max, so calibrating them is useless. Rather calibrate the joystick. Oh and BTW always be careful to never operate the joystick if the pots are close to an end. Depending on the joystick's travel you can create a short if the pot is at one end and the joystick at the other. I have noticed a couple times, before i calibrate the pot, the knob is not centered (by reading the analog readout), but after I calibrate the pot, the knob is actually centered. calibrate the joystick. not the pot. I saw there are psp 1000,2000,3000 joysticks on ebay. would psp2000,3000 work the same way? 2 & 3000 seem to have a little longer button on it and more color selection. an offtopic question: when we do calibration, do all the sticks, pots need to be calibrated at the same time? what I am trying to figure out is: say if I calibrated everything at one time, then I decide to just recalibrate the pot only. if i just recalibrate the pots and not the sticks, what happen to the previous calibration of the sticks? wiped out with uncalibrated numbers? cre8tiveleo wrote: calibrate the joystick. not the pot. The joystick and pot have different max/min values (resistance is futile). You calibrate the pot, your joystick will be 1/10th the effectiveness. or totally useless. You calibrate the joystick, and the pot still works. Just 0 the pot (mid point) and do the joystick calibration. I've had no issues. kaos wrote: if i just recalibrate the pots and not the sticks, what happen to the previous calibration of the sticks? wiped out with uncalibrated numbers? Yes, you always need to calibrate everything. thx, I will calibrate 'everything' and when the joy stick is in, I will calibrate the joystick. previously asked: can psp2000, psp3000 used just like psp1000? Probably a good idea if you are combining the pots in such a way to use a 100 Ohm resistor on each wiper output to limit the current in the event of this happening. sorry for the late response. My head has been preoccupied. Thx Bill. you have a drawing exactly how that 100 ohm resister is placed? I still have some problem interpreting Nerdish language. How does this affect the two pots, if occasionally I still need to use one or both of them for other purpose? I just received my PSP1000 with a white button. but the white button is completely loose from the pot stick. it just 'sits' on the stick, will fall off if I just tip the pot. I think it supposedly should be a press on with some snugness to hold it. But this one won't. Is there something I am missing? never had a PS. PS: Bill: the note under your post the word 'this country' is better changed to 'this world'. so 100ohm on the x and one on the y.
I haven't found the need. Ha, master nerd has returned. ok, so just one resister in line on the x pad and one on the Y pad. I am using one pot as 3 position switch now, another for adjustable flaperon. not using the 3rd one all at the same time yet. But the 3 position switch may be/will be replaced with a 6 button switch driven by Alduino (you saw that thread ). Just want to know 'what if' ahead of time. The button should be snug on the stick right? If so, I think I need to put some contact glue to put it on there and stay. To balance stick and the pots a 100 ohm on the x and y outputs is required and a 100 ohm on each of the central connections of the pot wipers otherwise the throw of the stick will be reduced by the influence of the pots (not much but a bit). Therefore four 100 ohms are required. My button didn't come off but pulling it off is easy so a well placed drop of glue should do the job. Both pots still appear have the same control they once had but also trim the stick. thx Bill. will use 4 100 ohm resistor. I also reread the original thread (forgot about that one, no wonder this thread seems so familiar ) using the psp1000 and found the answer to 'reuse' the original pots on demand - by adding a DPDT switch. I will be back here if I run into problem installing it. Working on another project which also need open up my Tx 'again', will do both at the same time.